New Law Changes Name of the Lawyer’s Assistance Program, Inc., to the Judges and Lawyers Assistance Program, Inc.
(L-R) Mark Suprenant, Rob Shadoin, Hon. Benjamin Jones, 4th JDC (Retired), Buddy Stockwell, and Mark Cunningham. 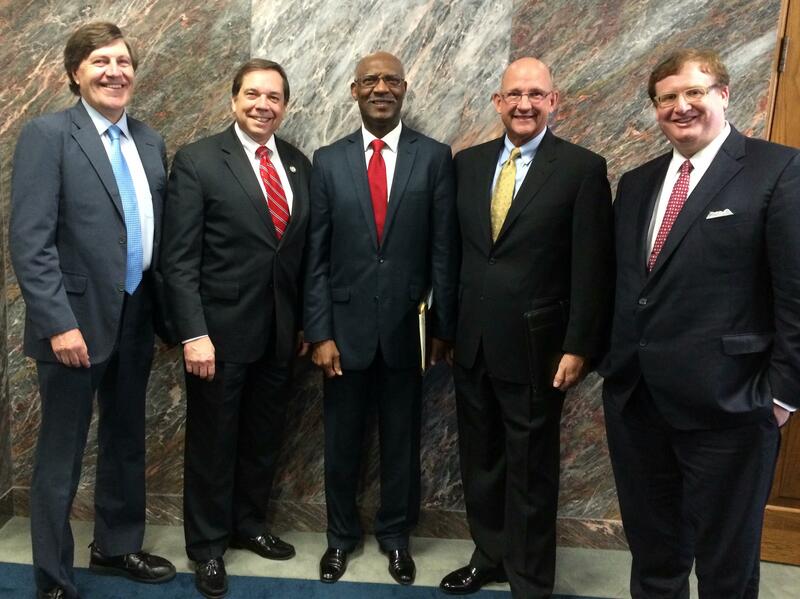 Appearance at 2015 Legislative Session in support of the amendment of La. R.S. 37:221. Prior law provided for the Lawyer’s Assistance Program to encourage the successful treatment of alcoholism and drug addiction among the judiciary, members of the La. State Bar Association, law students, and prospective law students. New law changes the name of the Lawyer’s Assistance Program, Inc., to the Judges and Lawyers Assistance Program, Inc. and expands the directive of the program to include counseling and intervention services for judges, lawyers, law students, and other members of the legal profession who may suffer from mental health issues. Existing law provides that any information, report, or record that the Committee on Alcohol and Drug Abuse of the La State Bar Association, Lawyer’s Assistance Program, Inc., or any member, or employee, or agent of either generates or gathers is confidential and privileged, and that no member of the Committee on Alcohol and Drug Abuse, or agent, or employee of Lawyer’s Assistance Program, Inc., may disclose that information, report or record without written approval of the subject judge, lawyer, law student, or prospective lawyer. Existing law provides immunity from liability for any licensed lawyer, and his supporting staff, resulting from any act made in good faith while engaged in efforts to assist judges, lawyers, law students, or prospective lawyers in connection with substance abuse counseling or intervention pursuant to the programs of the La. State Bar Association. New law extends the application of these privileges and immunities to the Judges and Lawyers Assistance Program, Inc. to also include mental health issues.